The world is advancing rapidly in its ability to share data and information in real time. Being able to instantly broadcast information to a group of people, and have those people respond accordingly, opens up unlimited opportunities for integration and use both for individuals and businesses. And leading the way in terms of real time data sharing is Twitter. Twitter allows you to broadcast anything, so long as it’s 140 characters or less. 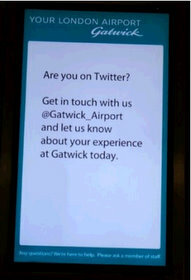 One of the latest and more creative ways that Twitter is being used is at the Gatwick Airport near London. Officials at Gatwick have put up signs encouraging travelers to send complaints, feedback, and suggestions to @gatwick_airport which is, of course, the airport’s official Twitter profile. As travelers send their tweets to @gatwick_airport, customer service representatives will receive that information instantly and respond accordingly. Basically the Gatwick airport has set up a real time customer service system that allows traveler’s needs to be addressed in real time.